House Bill 166 is a completely unrelated tax bill. Due to the handiwork of Petland’s attorney/lobbyist, this disgraceful amendment was slipped into the bill in the shadiest of fashions in an effort to avoid raising the attention of the voting constituents of Ohio. 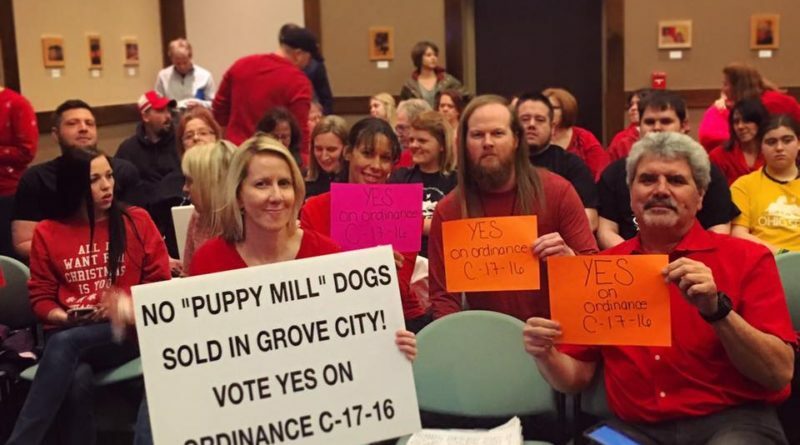 He (and Petland) believe they can sneak this shady amendment into law right under our noses while spitting in the faces of every city in our state whose citizens already demanded laws against the sale of puppy mill dogs. They have miscalculated our resolve. And we must stop them. But we MUST HAVE YOUR HELP TO DO SO! Please email the following individuals (contact info below) and ask them to vote against this shameful amendment which represents a perversion of democracy. Ohio is a home rule state – which means municipalities have the right to enact laws that they deem appropriate – like the ordinance Grove City just passed thanks to the leadership of Ted Berry and Laura Lanese. This amendment would undermine that completely and undermine the governing authority of the elected officials of our cities. This is a very dangerous precedent to establish and a very slippery slope being orchestrated by some very unscrupulous characters. So please, join us and let’s utterly bombard these state legislators with calls and emails. We must stop this amendment from passing! CALL, WRITE AND VISIT THE COMMITTEE CHAIRMAN BY FRIDAY, MAY 6 AND POLITELY ASK FOR REMOVAL OF THE PET STORE ANIMAL SALES AMENDMENT (LINES 1-169)! PLEASE ALSO CALL AND WRITE EACH OF THESE VOTING DECISION MAKERS AS SOON AS POSSIBLE. Senator John Eklund (R-18) – ANIMAL FRIENDLY! And lastly, please hit the share button below to spread the word and help us grow the team of folks who speak out against this!